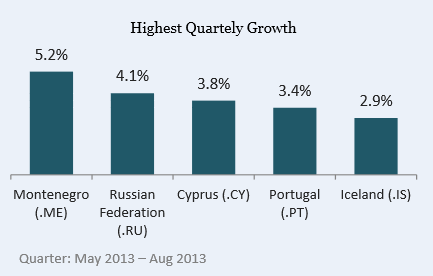 The chart shows the top five highest growth European ccTLDs in the quarter of May - August 2013. Montenegro achieved the highest growth at 5.24% followed by Russia who has been growing at an average of 1.5% monthly over the past 12 months. The Russian IDN .PФ (not in chart) grew 2.56% in the same period. The Portuguese ccTLD (.PT) has had consistent growth over the past several years and retained this strength after the Registry formally constituted its independence in June of this year. playmakeme.com moved to playmake.me then moved to make.me!